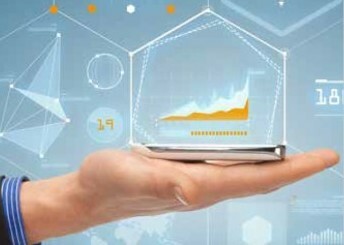 The need to process and analyze Internet of Things (IoT) data is driving business computing forward at a frenetic pace. IDC estimates that $737 billion was spent on IoT equipment and services in 2016, while Gartner predicts that there will be 8.4 billion IoT devices installed by the end of 2017 and 20.4 billion by the end of 2020, not including computers and smartphones. This incredibly rapid adoption of IoT technology is being driven by data-hungry businesses. More data from more sources – processed, combined, and analyzed in a timely manner – helps businesses make better decisions that allow them to streamline operations, provide better customer support, and rise above the competition. Realizing the value of IoT initiatives is not without its challenges, however. These challenges typically involve the combination of data from multiple sources (many of which have never been combined before) to provide a holistic operational view. Organizations may be divided physically and operationally, while legacy devices may be mechanical and therefore lack a digital footprint – both of which give rise to siloed information that is difficult to leverage. Furthermore, some decisions need to take place in real time and some do not. Businesses wishing to overcome these differences must rely on a combination of technologies, primarily edge and cloud computing. In general, computing has been in a constant evolution to meet business needs for data acquisition and analysis using the best technology available at the time. We’ve seen the rise of the mainframe, a centralized repository for compute and storage connected to dumb terminals, in the 1960s and 1970s. This was followed in the 1980s and 1990s by the adoption of the decentralized PC computing client-server model. The early 2000s saw wide-area and mobile networks grow faster and more powerful mobile computing devices, and this gave rise to cloud computing. Cloud computing has many advantages, yet it is still essentially a hub and spoke model that is deeply reliant on network connectivity. This architecture cannot completely meet business IoT needs. The rapid and massive expansion of scale of IoT devices at the network edge threatens to push centralized computing resources and networks themselves to the breaking point. Yet devices unable to connect to these resources still need to share and process data. Many times, IoT devices need to make real-time decisions, but this cannot be done quickly enough when they are required to traverse a series of networks to access cloud computing resources. There are also security concerns around transmitting sensitive business IoT data across networks and into the cloud. Businesses have further realized that working with IoT data exclusively in the cloud may lead to high storage and IT integration costs. For these reasons, a combination of edge and cloud computing is quickly becoming the accepted architecture for working with IoT data. This hybrid model is also referred to as fog computing, because it combines centralized and distributed computing resources into a single architecture that allows edge devices to communicate with one another and with the cloud. Edge technology is advancing rapidly and growing more sophisticated. IoT devices are getting smarter and smarter as sensors and CPUs become more efficient. For example, an assembly line, comprised of multiple connected machines and robots, is now a data center at the edge of the network. The ebb and flow of computing power from central to edge, from mainframe to PC to cloud, is now headed back to the edge due to the rapid rise in the sophistication of edge computing solutions. Combining the sophistication of the edge computing devices and IoT sensors with the recent increase in the sophistication of data processing and analytics technologies and methodologies means that we’re collecting real-world data about business operations in real time. This not only removes the performance gate of human interaction but also increases the sheer volume of data. Real-time decision making using real-world data must take place at the edge, and now it can because the technology is available to support the business need. While many IoT devices require real-time decision making at the edge, businesses require historical analysis for process improvement and model development. This is best done when the data from multiple edge devices can be combined centrally to provide the aforementioned holistic view. Moreover, the insights gained from historical analysis can be pushed back to the edge so that IoT-enabled edge devices can evolve to make better real-time decisions. The model now becomes a combination of edge and cloud computing where IoT devices operate at the edge in real time, collect and process raw data at the edge, and share metadata to the cloud for comprehensive historical analysis and continuous process improvement. 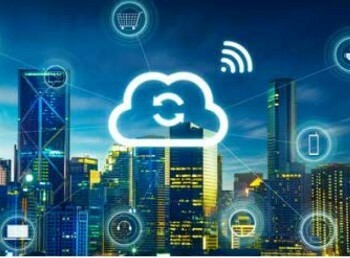 While requirements for building a successful cloud computing initiative are well understood, many organizations need guidance when it comes to selecting edge computing and IoT devices. Open standards-based architectures are required to build fully interoperable systems. Modular components are required for extensibility and customization. In many environments, hardware must be rugged in order to survive. And finally, integrated hardware and software solutions simplify development, speeding implementation and shortening the time required to start reaping the benefits of IoT initiatives. Manufacturers around the world are rapidly embracing smart factory technology. Yet, as many as 85 percent of the traditional devices installed in current factories may be unconnected. In many cases, mechanical legacy devices have no digital footprint. In other cases, a dizzying array of non-compatible devices, controllers, and control languages result in connected devices that can’t be monitored or controlled from a common platform. The combination of the physical divide caused by disparate components and the digital divide caused by analog and mechanical devices makes it difficult or impossible to leverage IoT technology to maximize operations for a specific factory’s requirements. And yet, sharing data, especially in real time, is critical to smart factory operations. Edge computing solutions that retrieve data from otherwise non-connected diagnostic ports and user interfaces, convert it to a network stream, and transmit it across an industry-standard IP network can be used to quickly and easily extend legacy manufacturing devices with smart factory functionality. This data can then be combined with data from newer digital machines to provide a complete view of internal operations. A central console that integrates many machines, systems, smart sensors, and other IoT technology completes the puzzle. Managers can be notified immediately to address a machine malfunction or failure before production slows. Combining historical and operational data provides the insight needed to plan and schedule predictive maintenance. The result of both scenarios is lowered operating cost and increased operating efficiency. 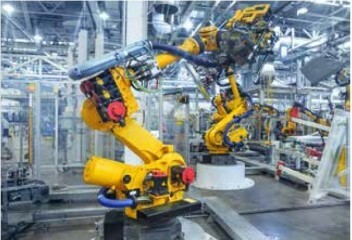 Smart factories integrate multiple edge computing devices from all over the business to leverage data from smart sensors and IoT-enabled connected machines to control production costs and increase productivity, efficiency, and production flexibility. Manufacturers embracing a hybrid model combining edge and cloud computing are best positioned to meet the challenges of a fiercely dynamic and competitive market environment. In the mobile world, user experience is dictated by a combination of bandwidth (the maximum amount of information that can be transmitted across a channel in a given period of time) and latency (the time it takes for a given amount of information to be transmitted across a channel). While many end-user tools focus on measuring bandwidth, network engineers have long known that latency is a more important measure for gauging quality of service, as improving latency decreases the user’s wait time. It’s relatively easy for mobile networks to add bandwidth by adding more channels or cell sites. Decreasing latency is far more difficult, however, since the performance of each component along the network connection must be improved. Adding increasing numbers of users to networks has presented great challenges to mobile network operators. However, early adoption indicates that the number of connected devices is poised to explode. Users could only access so many computers, tablets, and smartphones at once. But the number of unmanned IoT devices is rapidly booming. Massive increases in the number of IoT devices that require real-time interactivity threatens to bring mobile networks to their knees, and more and more applications will demand low latency for real-time interactivity. While 5G will provide higher bandwidth and lower latency per user, this will require sweeping changes to LTE network architectures. Pushing content, applications and services to the edge via Multi-Access Edge Computing (MEC) can alleviate the burden placed on mobile networks and cloud data centers by increasing numbers of IoT devices. MEC places smart nodes at the edge of a mobile network to emulate parts of the core network, cache content and apps, and run edge-optimized apps. Two uses of MEC that are being widely implemented now include distance measurements, positioning and precision tracking of devices; and video caching and analysis. Looking at these two use cases illustrates the enormous value of MEC. The first requires analysis of real-time streaming location data, and benefits from performing this function at the edge by removing the latency required to traverse the network to get to a cloud center. The second alleviates the demands placed on networks by video streams, and speeds analytics by running them at the edge instead of sending them across the network to the cloud. Successful MEC projects require the right architecture and the software and hardware needed to take advantage of that architecture. Devices should rely on open standards and include a modular design to provide the flexibility and extensibility that network operators require to preserve their investment. Hardware should also be rugged as it will be placed in the field and subject to a variety of conditions. MEC promises important benefits for network operators. Decreased latency occurs as a result of alleviating the need to traverse the network to get to a cloud data center and return. Decreased latency provides a better customer experience – and that can mean increased revenue for carriers. Carriers also benefit from better security because they are able to enforce policy at the edge, preventing bad traffic from ever entering their networks. Furthermore, MEC architecture allows carriers to streamline operations using real-time analytics on user traffic and activity. The military and aerospace industries require immediate analysis of IoT and other data to fulfill short-term mission objectives and long-term strategic goals. Military and aerospace decision making, both by humans and automated systems, can be a matter of life and death. Fog computing is a critical component in real-time operations, providing immediate local situational awareness through edge processing and allowing only the necessary information to be transmitted to the cloud in order to reduce latency and make real-time communication possible. Cloud computing then enables integration of data obtained from geographically dispersed edge computing devices. The use of a hybrid solution of edge computing and cloud computing highlights the power of the combination of these technologies to convert data into decisions. 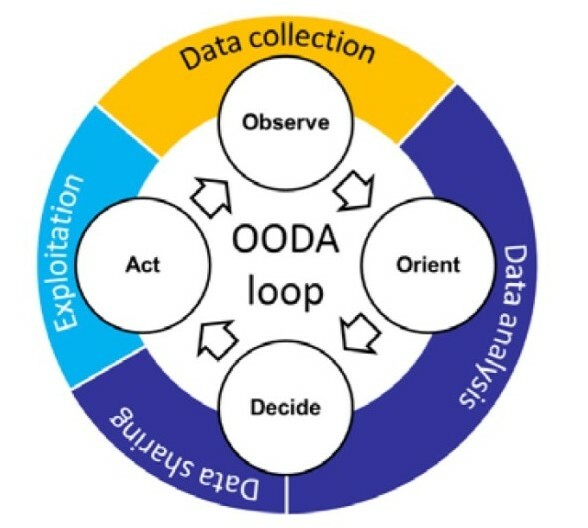 The military model of the OODA Loop (observe, orient, decide, act; see below) maps cleanly onto the process of data collection, analysis, sharing, and exploitation/action. Data collected from sensors is analyzed at the edge (on a portable device, in a tank, on a drone or a plane) where immediate, real-time action can be taken. Field command posts then aggregate the information to develop advanced situational awareness and take appropriate battlefield action. Strategic command then aggregates the information further to take action around long-term goals throughout the entire theater of operations. Fog computing is used in military scenarios to increase the efficiency and timeliness of maintenance and stores management. 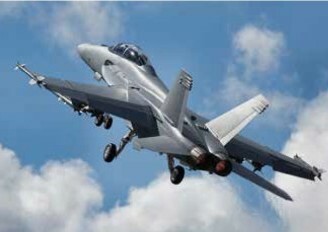 Assets such as tanks and planes communicate systems status and inventory via the cloud to depots. When these assets return from their missions, the depot has all maintenance, refurbishment and stores ready for a quick turnaround. Minimizing time spent at the depot enables these valuable assets to maximize their usefulness on the battlefield. Communications between levels must be fast and secure to effectively exploit battlefield sensor data. Speed is ensured through a combination of edge processing and only sending necessary data and metadata into the cloud. Security at the edge is fully tamper-proof and must remain so through multiple levels of networks and clouds. Each level must be able to operate independently in the event of a loss of network connectivity, taking immediate action when necessary to preserve human life. The above uses highlight the value of edge computing, especially when used in combination with cloud computing. This value extends far beyond these examples. Edge computing techniques can be applied wherever sensor data must be analyzed in real time to take immediate automated action or make immediate decisions, as well as to secure, aggregate, and streamline IoT data before sending it into the cloud for further analysis. Healthcare – used to gather and analyze data from wearables and sensors that monitor symptoms, medication, food intake, activities, and vital signs while managing these and other dedicated medical equipment at home and in clinical and telehealth settings. Retail – used for managing and analyzing data from POS and inventory control systems, as well as from WiFi and Bluetooth beacons, digital signage, in-store video, digital shopping carts, and social shopping tools to provide personalized offers and product information to in-store customers. Smart Buildings – used for management and preventive maintenance of lights, HVAC, elevators, electrical systems, plumbing, fire control, and security systems. Smart Cities – used for management and preventive maintenance of traffic lights, parking meters, street lights, autonomous and other vehicles. Edge computing is being rapidly deployed to help ease the burden of acquiring and analyzing IoT data. Data can be secured and processed at the edge to take immediate action when necessary and preserve network performance. As demonstrated by the examples shown above, edge computing, used in conjunction with cloud computing, helps unlock the true business value of IoT implementations. Competitive businesses can reap the benefits of enhanced and more efficient operations, increased revenue, and a better customer experience, including, in some cases, the protection of human life. Business leaders must look to open standards-based edge computing architectures to realize this business value today and tomorrow.